I believe this government cannot endure; permanently half slave and half free. Will the real Obama stand up? On January 25, 2011 Obama will deliver his State of the Union Address to millions of Americans. 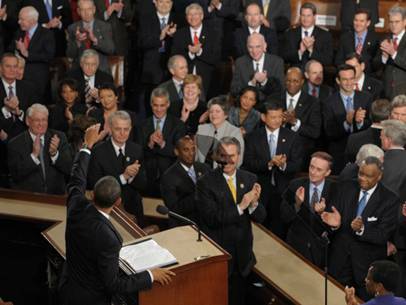 According to TVB, 48 million Americans watched his first State of the Union Address on January 26, 2010. Article II Section 3 of our Constitution states that, ‘He shall from time to time give to the Congress Information of the State of the Union…..’. He can also assemble both houses but other than custom, I cannot find that the members of both houses should be intermingled. In fact, it has been tradition that Republicans and Democrats sit with their own party. The State of the Union Address is Obama’s opportunity to lay out his legislative agenda and to chastise his opponents if he so desires. 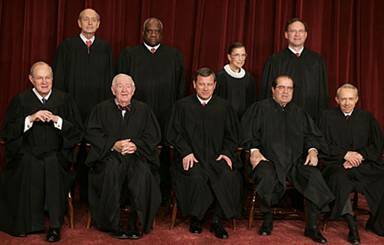 Keep in mind how Obama went after the Supreme Court’s ruling in his State of the Union of 2010. He intends to divide and conquer if we allow it. Presently the Republicans are in the House majority by 48 members. The Senate has 51 Democrats, 47 Republicans and two Independents, barely a majority. Togetherness and the ‘same’ syndrome have hit Congress with Senator Mark Udall, a Democrat from Colorado, leading the change. He is calling for Democrats and Republicans to ‘mix’ together as a symbol of unity. Udall’s letter to the Speaker of the House, John Boehner and Senate Majority leader Harry Reid and to the minority house Nancy Pelosi and senate Mitch McConnell leaders is enclosed for you to read. Somehow this seating arrangement will make them all come together as a big, happy family when arguing their views, for instance, on the Health Care Bill debacle. This is just another ridiculous ploy for the Socialists/Democrats to diffuse our strength. Senator Udall must have heard that there is ‘strength in numbers’. How many of you voted for a strong Republican to stand his or her ground? I personally did not vote so that they would seat next to each other and give the appearance of being ‘sociable’. Right now our congressmen and senators must fight for the freedoms we still have. There are some issues we can never agree on. The Health Care Bill, the out of control spending, and our family values. We may all be Americans but not all have the same goal for America. That is the reason why we cast our vote, so that these congressmen and senators represent our concerns and our views. We want them to take the battle to the House and Senate floors. We want them to argue and articulate why they support or do not support a bill. Civility and courtesy should be part of the discourse when debating their reasons for or against the issues, no one can deny that. But, we want to see that the Republicans are united in truth to restore our America. It is obvious that Obama’s all of a sudden pivot to the center is just an attempt to win reelection. His words at the Tucson Memorial may have sounded eloquent but the lack of appropriateness was noticed. Obama attended church yesterday in what I believe to be part of his strategy to win favor with church goers. His only purpose is to win in 2012. It would be advantageous for Obama and the Socialists/Democrats to not have the American public see the Republicans stand in unison. Republicans should stand together and sit together both figuratively and literally. Perception is everything and Obama will use even the State of the Union Address to campaign. Don’t let Obama’s blurring of the lines fool you. Let’s see how long before the Socialists/Democrats demonstrate their loss of civility towards Republicans and Americans! Section 3 He shall from time to time give to the Congress Information of the State of the Union, and recommend to their Consideration such Measures as he shall judge necessary and expedient; he may, on extraordinary Occasions, convene both Houses, or either of them, and in Case of Disagreement between them, with Respect to the Time of Adjournment, he may adjourn them to such Time as he shall think proper; he shall receive Ambassadors and other public Ministers; he shall take Care that the Laws be faithfully executed, and shall Commission all the Officers of the United States.